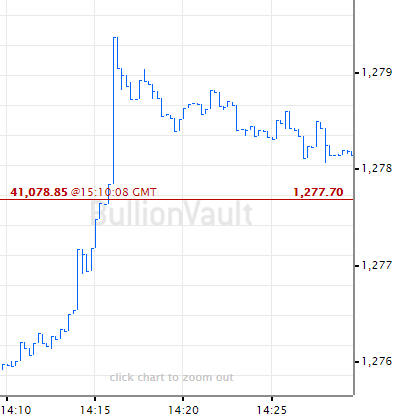 The GOVERNMENT of Turkey – formerly the 4th largest gold-buying nation – is targeting the country's huge private holdings with two new investment schemes aimed at releasing the value of this 'under the pillow' gold into the financial system. Bordering the European Union on one side and civil-war torn Syria on the other, Turkey in 2011 launched a bank deposit gold scheme, aimed at adding some of the country's estimated 3,500 tonnes of privately-held coins and jewelry to its official central-bank reserves as the Lira fell hard on the foreign currency market. Now repeating schemes already tried in India – the world No.2 annual buyer and No.1 private holder – Ankara this week announced plans for 'gold bonds' to deflect investment cash away from physical bullion, plus 'gold lease certificates' offering a rate of interest to gold owners who put their metal on deposit instead. 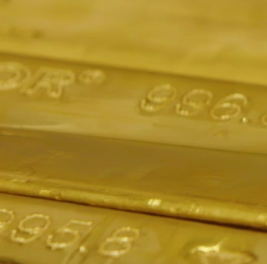 "With these important steps to ensure the foundations of the financial system," said Deputy Prime Minister Mehmet Şimşek, "our citizens will be able to provide additional returns from their idle gold under the pillow. 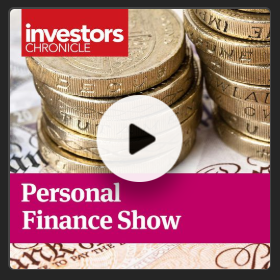 "Savings will increase, and the economy will gain momentum." 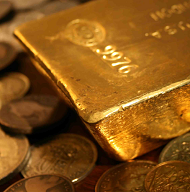 Şimşek estimates Turkey's household gold stockpiles total at least 2,200 tonnes, worth some $100 billion – equal to 13% of the country's entire economic output in 2016, or around one-third of its current M3 money supply of all coins and notes in circulation, bank savings and current accounts, plus certificates of deposit. 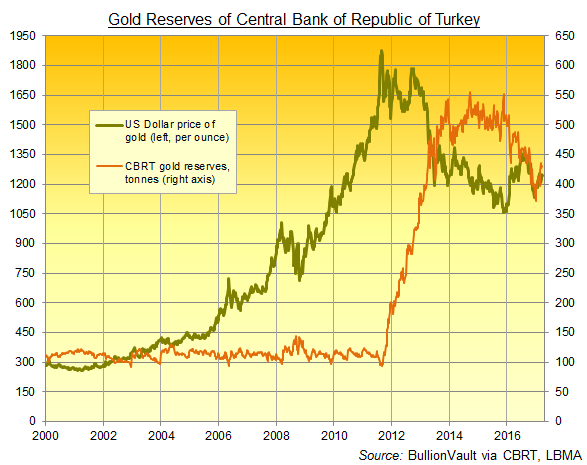 At its peak in summer 2013, Turkey's existing gold-deposit policy saw 260 tonnes of gold held for commercial-bank customers on one leading consultancy's estimate, taking the CBRT's official reserves to a then-record 480 tonnes. But "the bulk of this [investment] was made through cash payments," specialist analysts Metals Focus went on late last year, "rather than from gold collected from the public" – meaning that no so-called 'pillow gold' was actually monetised, with the scheme simply attracting new demand from household cash savings for gold-related investment. "By the end of June 2016, gold collected from the public, since the scheme was first introduced, amounted to just 55-56 tonnes," the consultancy added – an estimate repeated for end-2016 by last week's new Gold Survey 2017 from competitor analysts Thomson Reuters GFMS. Grown sharply as the gold price began falling in US Dollar terms in 2011, the CBRT's reported gold reserves have become highly volatile, shrinking by more than 30% at the start of 2017 from the 2014 peak, before recovering one-third of that drop by mid-March. India's so-called "mobilisation" program – the Gold Monetisation Scheme (GMS) launched in late 2015 – had by mid-February this year attracted just 6.4 tonnes of gold according to Arun Ram Meghwal, Minister of State for Finance, replying last month to a written question from the Lok Sabha, India's lower house of Parliament. Estimates say 18,000-24,000 tonnes of gold now belong to India's private households, accounting for perhaps one ounce in every 8 ever mined throughout history. The Indian government's second scheme – Sovereign Gold Bonds – has meantime drawn cash investment equivalent to 14.1 tonnes since it was also launched in late 2015. Tracking the gold price in Rupee terms, the bonds also pay a rate of interest on top. Currently set at 2.75%, that incentive has been blamed for the recent liquidation of gold-backed trust funds (ETFs) listed on India's stockmarket. The government of Narendra Modi last month slashed its 2017-18 targets for the gold schemes in half, "turning more realistic" in the words of the Financial Express after hitting just 40% of the current fiscal year's target. New Delhi now estimates its GMS and Sovereign gold bonds will attract " just about 2% of the country’s annual consumption," says the news-site – "far from a runaway success even a year and a half after their launch." The country's current account deficit with the rest of the world has shrunk by three-fifths since 2011's record – then worth 9.6% of Turkey's annual GDP – but the Lira has continued to fall on the FX market, hitting fresh record lows this New Year. Şimşek in January denied to CNBC that Turkey was in the midst of a "currency crisis". The Lira has since rallied 2%, holding the gold price for Turkish consumers at February's new all-time highs of TRY 148 per gram, five times the price of a decade ago. 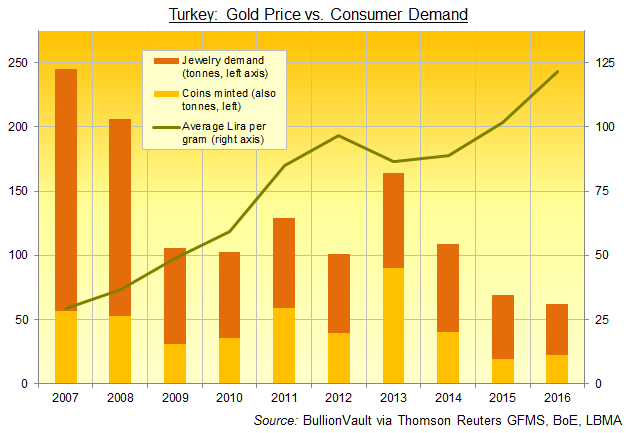 Turkey's household demand has shunk by 75% since 2007 according to data from specialist analysts Thomson Reuters GFMS, making it the sixth-largest gold buying nation for private consumer demand in both 2015 and 2016, behind China, India, the US, and now Thailand and Germany. Compared to 2013's global peak – when a 25% crash in Dollar prices unleashed record jewelry and retail investment buying worldwide – 2016's total consumer demand for gold was 30% lower worldwide according to Metals Focus' presentation for the mining-backed World Gold Council, depressed by lst year's rally in prices, plus anti-gold policies in India and weaker economic growth in China. Turkey and the European Union have meantime suspended diplomatic talks until June according to media reports in Ankara, delayed by mid-April's controversial referendum on giving President Recep Tayyip Erdoğan sweeping powers he says will help fight terrorism but which opponents say risks dictatorship. After last July's failed coup attempt in Ankara, Erdoğan in late 2016 blamed foreign forces and internal rivals for driving down the Lira, urging Turkish citizens to hold their national currency rather than Dollars, as well as buying gold to stabilize the economy.